Two for one deal in GREAT location!! Listing included both 6339 & attached building 6333. Estimated 8,000 square feet. Buildings located right in the middle of prime development area on corner of Michigan Ave and Livernois, between the Cork Town and new Dearborn train station. 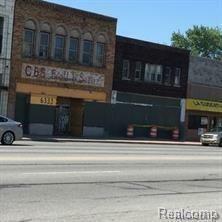 Great investment rehab project in this up and coming area! Entertaining serious cash buyers only with proof of funds. Buyer must obtain own warranty deed. Quit Claim deed only, sold as is. Listing courtesy of Heritage Realty Services Llc.